You Save $1.65 by purchasing this kit rather than buying the items separately. TIPS: DO NOT melt this color bar in the microwave as overheating will cause clumping and speckling of color in your final product. Using too much color may cause staining. Test your final product to insure optimal performance and no staining. Protect work areas and clothing when mixing. COMMENTS: I love these colors, they’re fantastic. COMMENTS: Just awesome in melt and pour soap projects. This mixes well leaving no clumping at all. Very pleased with the colorant's behavior. COMMENTS: I absolutely love WSP's neon powders, I really didn't have much trouble with speckling when using the powders in m&p, I'm very careful with dispersing. But I decided to give these a try, I figured at the least, they might be a little bit faster than using the powders. They are very vibrant and easy to use! I haven't had any issues with speckling, like I see in some reviews, maybe it's just my method. I don't use m&p for anything other than embeds and sugar scrubs, so these blocks last me awhile, especially since it really doesn't take a lot to get a good vibrant color! • Easy to use and great price! "Bright neon soap color bars "
COMMENTS: These are a very bright colors , only takes a very little amount. "Great for trying things out"
COMMENTS: easy to use and to try colors out to add to your line. "Used in a rainbow themed soap!" COMMENTS: These colors were gorgeous in a goats milk MP base. The purple was my favorite! COMMENTS: This is a great set because you can try lots of colors before you buy a full size bar. COMMENTS: Wow, the colors are amazing! Use less with more soap and you've got pastels. Where are earth can you get these many colors for this price! Definitely will reorder. Used for children's soap. COMMENTS: I'm fairly new to soap making so it was great that I found this sampler set of color blocks. I knew I wanted non bleeding colors and I had no problems at all with these bleeding in my M&P soaps. In some soaps, I made as many as 5 layers. Not only did they not bleed, but my grandkids loved the neon colors. I gave them as Christmas presents and they are already asking for more. I used the color blocks in both aloe & ultra clear M&P bases. I'm going to try them next in Shea & Goats Milk bases. I think they will turn out a lovely neon pastel color. Thanks for offering this great sampler set at such an amazing price. COMMENTS: It's my first time "soaping" and I'm glad I bought this set. I already experimented with the colors and it was fairly easy to use. It is described as neon but I'm happy to report you can come out with nice pastels with it too. I was even able to recreate a nice robin's egg blue. • Add a small slicer type item. COMMENTS: One cube of each color and each cube colors 5lb. to a medium tone. That's lots of soap colored for a very good price. Easy to build a collection of color options with these sample sets. "Great samples of each color"
COMMENTS: Separately packaged so they don't get other colors mixed with them. I like having so many different colors to try so I can see what I want to carry. These are very vivid colors and produce great colors in white or clear soaps. 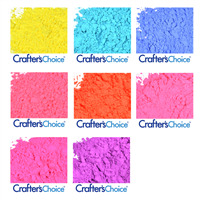 "Great sample kit and easy to use"
COMMENTS: This kit is perfect and affordable for trying out the neon colors. They did not bleed at all in any of my soaps. They do take a little while to mix into the base, but I found a few easy ways to mix the colors. I will add the amount I want to the base and heat it up making sure to stir every 15s until it is fully dissolved. I will sometimes add an ounce or two of base to the color and heat that up making sure it is thoroughly mixed before adding it to whatever I want. My only wish is that a detergent free option becomes available. "Colors are stunning but they bleed into white base"
COMMENTS: As with the Stained Glass Soap Color Bar Set I tried, any embeds you color with these and use in white soap will bleed into the white. That won't be an issue, however, when you tint the base throughout. These are gorgeous colors, wonderful for children and the young-at-heart, and as cheery gift soaps. I've seen some amazing loaf soap ideas using colors like these, which I'm eager to try, and probably will this summer. "Great Mix Of Colors and Enough To Test!" 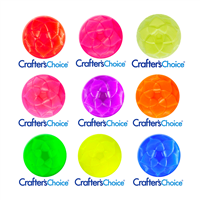 COMMENTS: I just loved the selection of the neon colors, it gave my grandchildren choices to pick out there colors for their favorite soaps without me having to buy a bunch of colors. They had alot of fun and it was great to see how much I would need per loaf to get the shade. I really love the Pink! It's a favorite in our household and I have gone on to order it whenever I can! Second place is Purple! 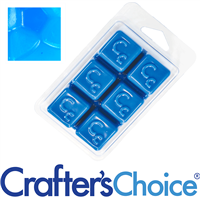 I had tried before buying each of the colors buy themselves and of course you use several colors when making CP soap and I have a box with pieces, but buying this way having the samples I can use all at the same time, very convienient. COMMENTS: Great sampler pack for a great price. All the colors are very pretty. "Great way to try out all colors! " COMMENTS: These neon colors are so bright with a super good color! They can be light to dark, depending on how much you use. You can't get any easier than the color bars. A must have when doing MP soaps. This neon sampler pack is a fantastic way to try all the neon colors out. I'm so happy I got this pack. "a little hard to blend"
COMMENTS: This was my first try at color blocks. It gave a good color but I thought it took quite a but to get the desired shade and it didn't melt very easily in my MP. I had to really stir and even squish it with a spoon to get it to melt good. COMMENTS: These color blocks are easy to use. No dripping like my liquid colors. The only thing is these don't seem as economical as other colors if you do a whole lot of coloring. But the trade off is they are less messy and easy to use. I will continue to use these in some applications. COMMENTS: Nice and vibrant that melt easily in a melt and pour base. Great for testing out new colors without buying a whole bar. COMMENTS: Wow. Neon is right. Lol. I use a lot of honey base so I mix neon colors with stained glass colors, it is the only way I have found to get the colors "right." I am glad that I tried this, or I probably never would've figured that out. I had all these little color bars to play with...lol. Please make a detergent free version! COMMENTS: I love the sampler packages at WSP. They are a great way to try out various products before committing to a full sized purchase. The neon color sampler is no exception. Recommended. COMMENTS: Love this set. It allows you to try a wide variety of product at a great price. Perfect for summer. Amazing quality. I have never had a problem with WPS color bars. Amazing versatility and results. COMMENTS: This is a great sampler and allowed me to " try before buying" lol. All colors were gorgeous and mixed in well. Very easy to work with. COMMENTS: A great add to any base. COMMENTS: Love the price for trying out the new colors. Haven't found one color that I dislike. They all blend very well in the melt and pour soap bases. Let's me blend colors to create cool designs. COMMENTS: I had never used these before and wasn't sure how I'd like them, so I got the sampler pack. I love these things! Talk about easy to use and adjust your hue. Looks like I'll be buying more soon! A little goes a long way as well! COMMENTS: This is a great way to try many colors. Melts in well, colors are beautiful. COMMENTS: Beautiful colors! Purchased the sample pack and 10 pounds of soap, thinking I would run out of colors BUT I have a LOT of color bars left! All you need is a VERY tiny slice to color MP soap in small batches. Colors have not faded. Great sample pack for those who are wondering about the colors. They blend beautifully with DF MP soaps. "Nice way to try out colors." COMMENTS: I was pleased with this purchase. A little bit goes a long way and it is nice to have the variety of colors on hand for projects. I used this with melt and pour soap and added it to soap that was fluid at about 100 degrees. As it takes a bit of time for the color to melt and see where you are at with the shade, you need a bit of patience to get the most out of it. At times I needed to get my base hotter so I could get my colors coordinated to work with multiple colors. However these are convenient and easy to store and I would purchase again. COMMENTS: This sampler is great to try out different colors. This is the first time I've used color blocks, and I was more than pleased. I will be ordering full size products of these. COMMENTS: Shows off some nice neon colors, works well in both opaque and clear. Have not had any issues with these colorants, highly recommend this. "Color Sampler: Soap Color Bars - Neon"
COMMENTS: I love these colors very much. I was having a problem with small to medium bits of soap not melting as well. However, I started melting the color bar first and then adding in the clear melt & pour and this worked really well. I wish the colors did not fade so much because I just love the initial colors. Maybe I will have to start making smaller batches. COMMENTS: I will only use these color bars for my neon colors from now on! They incorporate well and don't bleef. COMMENTS: I love the idea of a sampler! I did try to use one of these bars and it failed, but it was more than likely my fault as I am new to the soaping hobby. I like that I was able to purchase a big of each of these bars for an excellent price. COMMENTS: Love these in cp. Colors are vibrant, however did have to strain them after melting in microwave, as there were some bits that didn't dissolve. Still a good product. COMMENTS: I used these in melt and pour and they never seam to melt all the way leaving spots in my soap where it didn't completely melt. I'm going to stick to liquids and mica's! Won't be buying these again! WSP Response: I'm sorry to hear that you had problems with the soap bars. I would like to suggest that you chop the soap bar into smaller pieces, and try dissolving it in already melted soap to mix your color in. I hope you have better results next time around. COMMENTS: I like the colors but they sometimes leave sediment at the bottom of my soaps! "Two thumbs up from an old school soap maker!" COMMENTS: Ok, I've been making soap and candles for a VERY long time and I remember when the "soap color blocks" were like using colored bricks--hard, crumbly and difficult to use. I was pleasantly surprised when I bought this sampler pack and tried them. Unlike it was "back in the day" these blocks are much softer making shaving off just the right amount SO much easier. I love that there is virtually no waste as they don't chip or flake. And they melt in the warm soap much better which means less stirring which means less air bubbles. Absolutely awesome! COMMENTS: I liked every color I used in this kit. It is a great value and nice to have all these popping bright colors for summer. When I received this, both the orange colors came to me sweating. None of the others did. When I tried to use the orange colors they would not melt properly. The other colors were fine. Very odd. So, I called WSP Customer Service and they gave me credit for the two orange samples. I appreciated this customer support. I highly recommend and will order again. COMMENTS: This is a great product. I like it better than the powders. The colors are like candy and bright. I enjoy making the soap and choosing the combinations of colors. I recommend these. COMMENTS: Wonderful sample! I enjoyed experimenting with the colors. They melt nice is hot soap. Will probably buy again sometime. COMMENTS: I love how easy to use and easy to store these are!! COMMENTS: Wonderful product, great customer service, fast delivery! Good product, but like the powders better. COMMENTS: Love these colors in my melt n pour soaps! Nice summer colors to go with your fantastic summer scents! "Bright and Smiley on a Artic Blast Day"
COMMENTS: Just the right bright colors to brighten up on the coldest winter days. COMMENTS: All of these colors are awesome. They come out bright. Great for mixing colors. I recommend these highly for glycerin based soaps! "Color Sampler: Soap Color Bars-Neon"
COMMENTS: I used just a tiny bit of the Neon Tutti Fruiti color bar to color a batch of Peony MP soap a lovely pastel pink shade. The color was a gorgeous soft pastel pink-not neon at all! Simple to use and a little goes a long way. Love these color bars! COMMENTS: fantastic sample kit. will buy again. COMMENTS: Great way to try out the different colors without commiting to a large amount of them! COMMENTS: After a lot of research, i chose the coloured blocks to add pigment to my melt and pour soap instead of the pigment powders. This colour sampler was perfect! the mix of colours is ideal and it was very easy to use. COMMENTS: I go this as one of my free gifts. Well, stupid me, I put the entire block in one pound of soap. WOW! Now that was way to dark. Then I read the directions, and 1 square does up to 5 pounds of soap! YIKEES! Oh well, live and learn. But, this is a GREAT PRODUCT! COMMENTS: Colors worked beautifully in my M&P clear base - my friend's loved the colors. COMMENTS: I received a sample, figuring "well it didn't cost me anything" Oh man! I love these. They're easy to use and the colors are PERFECT! "Are these products natural and what other products can these be used other then soap? " Staff Answer Soap color bars are actually made from melt and pour soap and can only be used in soap. They are also not a natural product. "The ingredient lists on the individual bars are very long. How would one go about ingredient listing these colorant bars on a final product? " Staff Answer Hi Sandra - Since soap color cars are made of soap and color it does have a longer ingredient listing. This cannot be shortened, as shortening it would be against FDA regulation. All ingredients must be listed in descending order of predominance. You could use the powder colorants for a shorter ingredient list. 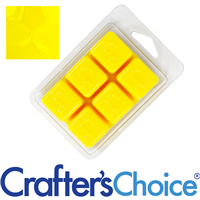 "how do I use this block color in hp soap making?" Staff Answer The soap color bars are highly pigmented pieces of a melt and pour soap base. Many CP and HP soapers embed melt and pour soap into their loves. This color bar would be an excellent way to color your melt and pour embed. Using the color block as is would deposit too much pigment in one area resulting in a soap bar that may stain the skin. "Can these be used in CP soaps?" Staff Answer The soap color bars are created using a clear melt and pour base with a concentrated amount of powdered colorant added. 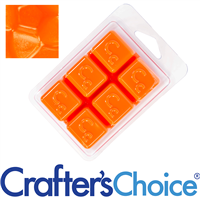 Therefore we recommend using our soap color bars for MELT AND POUR projects only. "Some of the Neon Colors speckled when mixed into soap. Did I do something wrong, or do these colors speckle?" Staff Answer Try mixing well with liquid glycerin first. We like to use the mini mixer sold on our tools page. You can make it ahead of time and store in a small jar with lid. Then use liquid as desired in your soap. This will eliminate speckles. i had the same problem with these soap color bars. what i ended up doing was using a hairnet as a cheesecloth to filter out the specs. it actually worked quite well! just be very careful when you're pouring your speckled soap through the net as it has to be done very slowly or else it will get everywhere. "can these colors be used in hot processed soap?" Staff Answer Soap Color Bars are made using Melt & Pour soap as the base. Therefore we recommend using them only in Melt & Pour Soap. "How do these work...do you break off a piece and melt? How do they work...if I was making a 2lb loaf with four different colors, how much of one color would I use and how...thank you in advance "
You can break off a piece from the bar. I cut up small pieces then melt it separately in mp soap. If you have four color you want to have four bowls with mp soap in it. Melt the mp soap and color at the same time. Also, it depends how much color you want in your soap. Test it out. Staff Answer Because the Neon colorants are more sensitive to heat we recommend that you finely chop the amount of color bar you want to use and then add it to your soap after it is melted. Do not melt it in the microwave with your soap as this could cause the color to speckle in your end product. For this, add color after the soap is melted. I tried putting it in the microwave with the unmelted soap but it did speckle and it didn't look professional. Just stir it in and it should melt quickly. Also, start with a little bit and keep adding more if needed. A little goes a long way. "Can these colors be used in soy candles? If not do you have ones that would? " Staff Answer These Soap Color Bars are for MP Soap ONLY. We do not carry candle safe colors anymore. "Can these be used in wash base formulas?" The soap bar colors are colors that are suspended in a solid soap base - if you tried to use these in a liquid formula it would mess up the formula and you could end up with soap clumps as well. The liquid dyes would be better to use. "Can these be used in lotions?" "Can any of the color bars be combined...such as melting a little yellow and blue to get green? Thank you." Staff Answer You can mix these...and they make beautiful blended colors! !